Part I. Fundamental Aspects and Instrumentation.Chapter 1. Developments in interface technology for combined liquid chromatography, capillary electrophoresis and supercritical fluid chromatography-mass spectrometry (W.M.A. Niessen). Chapter 2. Ionisation methods in LC-MS and LC-MS-MS (TSP, APCI, ESP and CF-FAB) (B.L.M van Baar). Chapter 3. Optimization of instrumental parameters for flow-injection analysis, thermospray tandem mass spectrometry (R.B. Geerdink). Part II. Environmental Applications.Chapter 4. LC-MS techniques for the analysis of dyes (J.Yinonet al.). Chapter 5. LC-MS: a new window for trace-level monitoring of pesticides and their transformation products in environmental water samples (D. Barcelóet al.). Chapter 6. Separation, identification and quantification of surfactants and their metabolites in waste water, surface water and drinking water by LC-TSP-MS, FIA-TSP-MS and MS-MS (H.F. Schröder). Chapter 7. Particle beam mass spectrometry for the identification of environmental contaminants and agrochemicals (M.J.I. Mattina). Chapter 8. Particle beam mass spectrometry for the analysis of aqueous and hazardous waste leachates (J. Hsu). Chapter 9. Liquid chromatography-mass spectrometry of organotin compounds (L.D. Betowski, T.L. Jones). Chapter 10. Liquid chromatography-mass spectrometry of seafood toxins (M.A. Quilliam). Part III. Complementary Techniques. Chapter 11. On-line post column liquid-solid and liquid-liquid extractions in environmental liquid chromatography-thermospray-mass spectrometry (R.J. Vreeken). Chapter 12. Capillary electrophoresis/mass spectrometry applied to environmental analysis (W.C. Brumley, W. Winnik). Notice. Acknowledgements. References. Subject Index. Looking at the literature available, it is clear that there is a need for a book on LC-MS applications in environmental analysis. This book endeavours to answer the following questions: What interface to use to solve "my detection problem"? Can I obtain enough sensitivity for the confirmation of my compound in real-world environmental samples? Is there enough structural information? 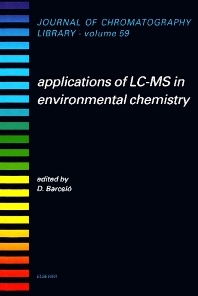 The present book aims to provide a critical evaluation of LC-MS in environmental chemistry and it is structured in different areas. Apart from an introductory section with fundamental aspects, application areas using the most relevant interfacing systems (PB, TSP, ES) for the characterization of environmental compounds are included. In this sense, applications are discussed on the characterization of the most relevant compounds of environmental interest such as pesticides, detergents, dyes, polar metabolites, waste streams, organotin compounds and marine toxins with comparison between different interfacing systems. Finally, new methods and strategies in LC-MS, e.g. the use of capillary electrophoresis, MS together with on-line post-column systems in LC-MS are also shown. By the nature of its content and written as it is by experienced practitioners, the book is intended to serve as a practical reference for analytical chemists who need to use LC-MS in environmental studies. Each chapter includes sufficient references to the literature to serve as a valuable starting point and also contains detailed investigations. The broad spectrum of the book and its application to environmental priority compounds makes it unique in many ways.